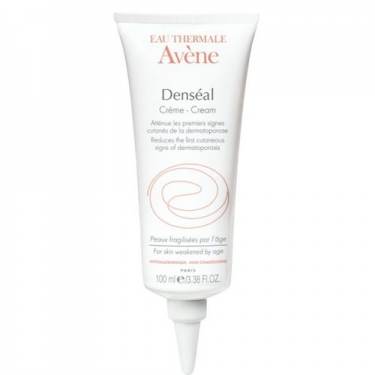 DESCRIPTION: Denséal Crème from Avène is a body care for sensitive skin weakened by age. Formulated with Hyaluronic Acid, Retinaldehyde, glycerine and vegetable oils and enriched with Avène Thermal Water, returns the density and elasticity, nourishes and hydrates while soothes and comforts the skin. The first signs of weakness by age are mitigated. Hypoallergenic and non-comedogenic. Without perfume. Apply at night on vulnerable areas (forearms, hands, legs, etc.). Massage until complete absorption. Should limit sun exposure while applying this treatment.